Gemini v6.8.5 - Canned Comments & Descriptions, SLA Breach Date, Organization Security Enhancements, New Portal User Restrictions, and Bug Fixes. 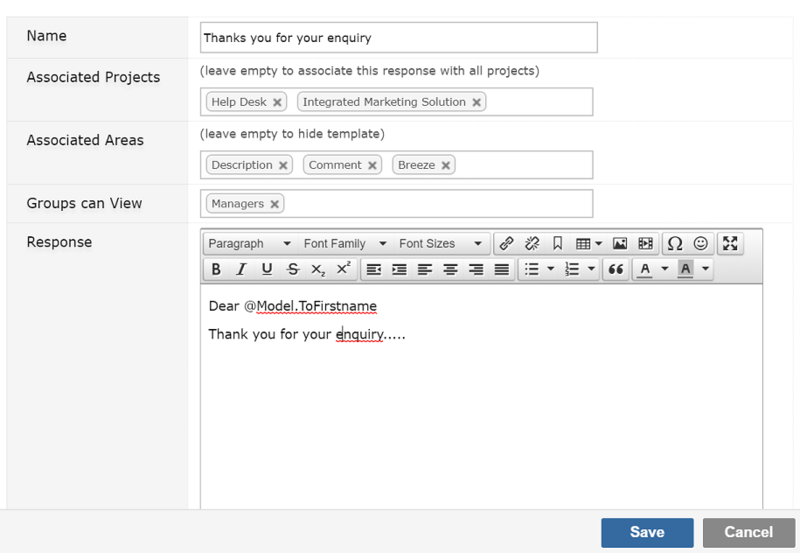 define a new Canned Comment/Email Reply/Item Description from the Comment, Email Reply, or Item Description data entry Rich Textbox (see below). used in all projects. You can specify whether the canned item can be used for descriptions, comments, email replies (Breeze), any combination thereof, or all. so you can tell your users what they can’t do in any language. A new level of granularity has been added to Organizations allowing administrators to restrict item creation and view to one or more organizations. This level of security will only apply to users who are in the Permission entry: "Can Only View Own Organization Items". Permission Sets are project-specific, so some projects can be excluded from this type of validation while others are locked down. 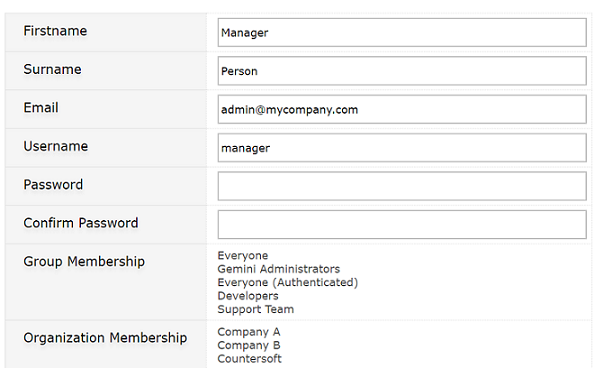 User Profile - To use the new Organization Security functionality, first assign users to their Organizations. Users may be assigned to more than one Organization. where Organization has been added to the first tab. User Record - The view of the User Record now lists the Organization(s) the user belongs to (Customize -> People -> Users). Data Entry - If a user is a member of more than one Organization, the Organization drop-down will be the first item on the data entry and full edit screens. (where that Organization will simply be defaulted onto the ticket). 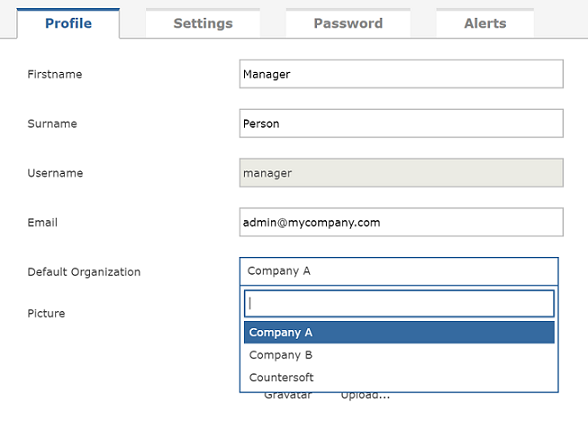 Viewing Data - If the users are in the Organization restrictive permission set, users will only see records marked as belonging to the organizations they are in. As stated, users who are in only one Organization will not know this is occurring, as there is no display of Organization. must use the Item View Screen (click the item hyperlink on the grid), and select the Edit option on the right hand ribbon control). Gemini will now put out an error message 'toastie' (a message that slides out of the top right, pauses and then slides away) if the maximum file size for attachments is reached and the file cannot be uploaded. It will tell the user the maximum file size as determined by the web.config setting for MaxRequestLength. Each web application has a maximum request size, this is the limit of data which can be sent in a single request to the server. This is common across all applications, not just Gemini. Gemini will now, where the browser supports this function (tested IE, Chrome, Firefox), alert you if you attempt to post a file which is larger than this limit. If you drag and drop files onto the Gemini upload panel, each file is its own request, and therefore can be up to the full limit. If you upload multiple files at once, for example, when creating a new ticket, your total file size and form data must be less than the limit specified. The maximum upload limit is set in the web.config and is a defined as the MaxRequestLength property of System.Web. Note: this facility does not give GeminiAdministrators the ability to limit a per file size limit, but collective limit for all files and data sent in a single request. Example one: Joe creates a new ticket and adds three attachments of 2Mb each. The request limit is set as 4Mb. Joe receives a warning and the files are removed from the ticket. Joe can create the ticket without the attachments, and when the ticket is created, drag the three files onto the drop area and all three will be added. Example Two: Jane creates a new ticket and adds one attachment of 6mb. The request limit is set as 4Mb. Jane receives a warning and the files are removed from the ticket. Jane can still create the ticket without the attachment. When the ticket is created, Jane drags her 6Mb file onto the drop area, but Jane still receives the warning as the limit is over the 4Mb single request limit. Summary: It is a maximum request limit, not file size limit. Multiple files can be added separately providing any single file is less than the request limit. set up for them by an administrator, they will not be able to drill into or manage Workspaces. iPhone users can now use the new Countersoft Gemini iOS app. Search for "Countersoft Gemini" on the App Store. We have released a new Countersoft Gemini Andriod app. Search for "Countersoft Gemini 6" on the Google play Store. You can now see when a ticket's breach date is expected. 24 x 7 SLA can now have a calendar associated with it to specify non-working days. 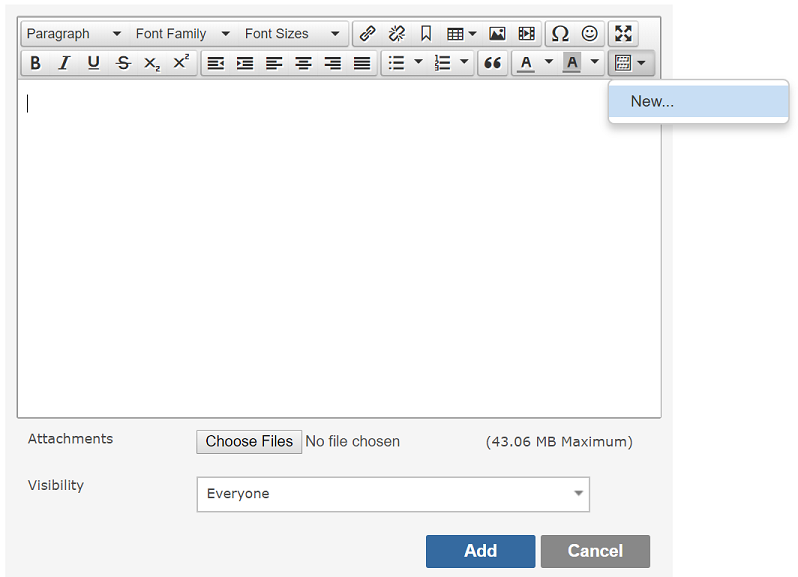 The rich text editor can now be maximized to cover the full page. We have added Auth0 as an authentication provider. A GDPR application to obfuscate or delete customer data in the Gemini database. An archive utility that archives and restores data in the Gemini database by data sets (6.7.1 upwards only). A Cloud Synch utility that allows hosted customers to maintain users from their in-house AD, avoiding manual duplication of user maintenance. Extended integrations into Salesforce (powered by FormTitan). For more information, pricing on 3rd party integrations, or to request a new custom integration for your business, email dele@countersoft.com.